I wasn’t really feeling front row material if I’m honest. Preparation for this event had not panned out as I had hoped due to sporadic illness and other commitments, but here I was anyway, very apprehensive and in full knowledge of the magnitude of what I was about to undertake. That sounds like an excuse, but is really a statement of fact. A few had speculated that I had been hiding my efforts on Strava as part of some strategic plan. If only that were true! 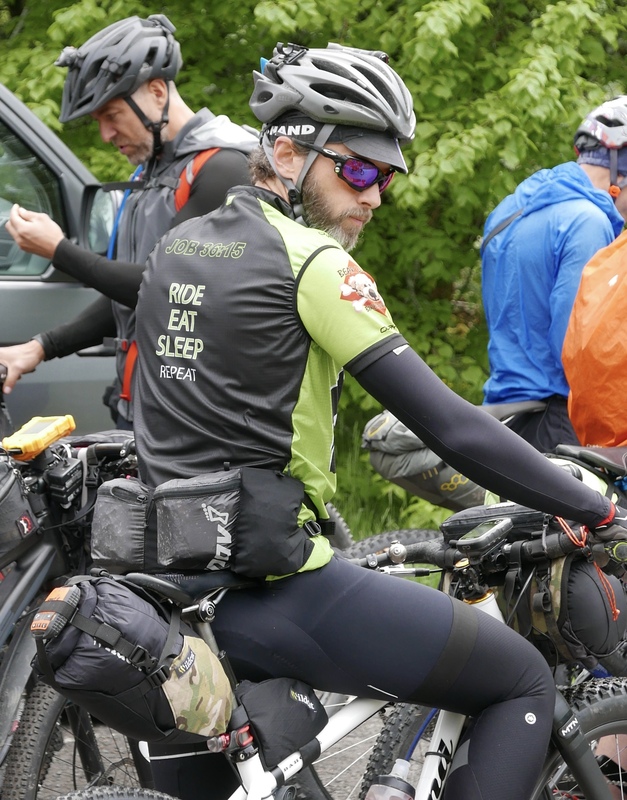 Tucked in my jersey pocket was a carefully prepared schedule for the entire route, dividing each day into sensible chunks and the whole route into a manageable sub-6 day schedule. Just make sure you stick to the plan. Take it easy. Enjoy yourself, but make sure you finish; you don’t want to be coming back for a fourth go. At the sound of “Go!”, at precisely 9 O’Clock on Saturday 28 May, we were off up the trail. You’d think when you’ve got 550 miles of riding ahead of you, there’d be no tearing hurry to get off the line, but when someone shouts “Go!”, I feel compelled to comply with the instruction instantly. Thankfully it wasn’t long before the favourites for the race took their turn at the front and allowed me to sit up slightly and catch my breath. 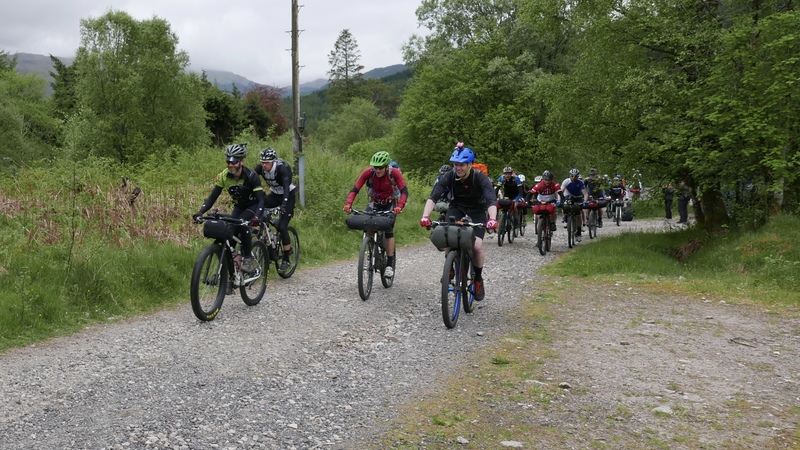 The initial miles passed reasonably easily and groups of different riders formed and dispersed as we transition from glen to glen. I stopped for my first photo, catching Lee Craigie for the last time as she disappeared off up the trail, not to be seen again until the Real Food Cafe after the finish. After a cloudy start, the sun had broken out and with it a warmth that forced me to shed layers to avoid overheating. I rode briefly with Gian and Ian Fitz, but my desire to stop and capture the enormous mountain vistas was at odds with their more steady and measured effort. 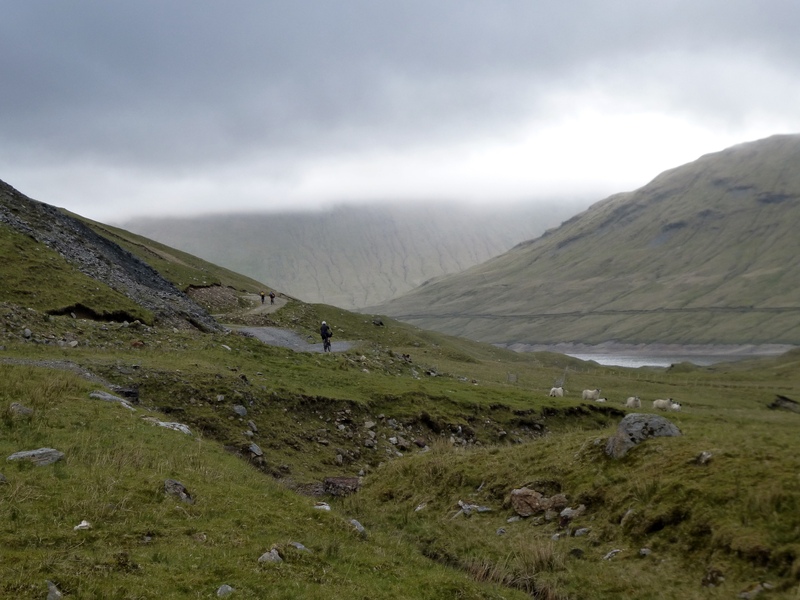 The end of my first significant section on my schedule was Ben Alder Cottage, at 80 km. A decent ride in itself, but in real terms less than 5% of the route, and only halfway to the pizza house in Fort Augustus. 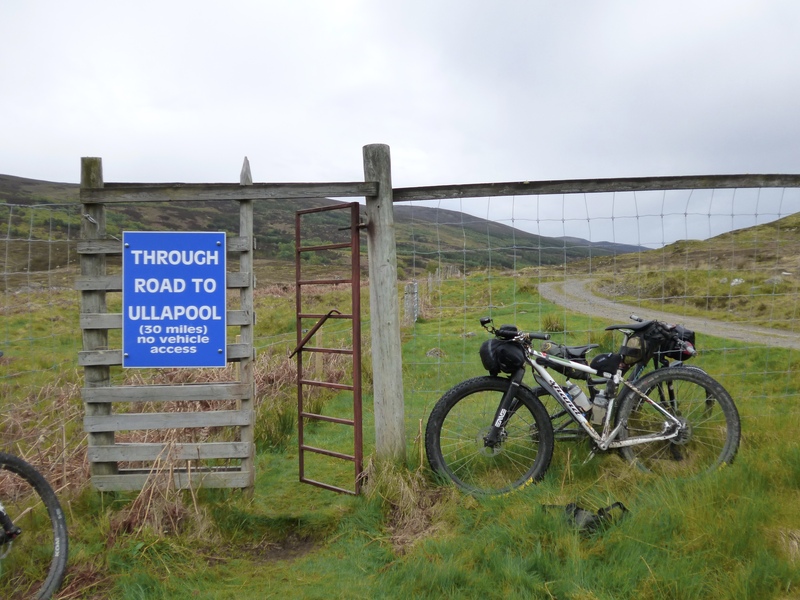 The ride here had been good fun, and a nice opener to the route; the sense of wilderness and detachment from civilisation seemed to come much sooner than via the old start on the WHW. 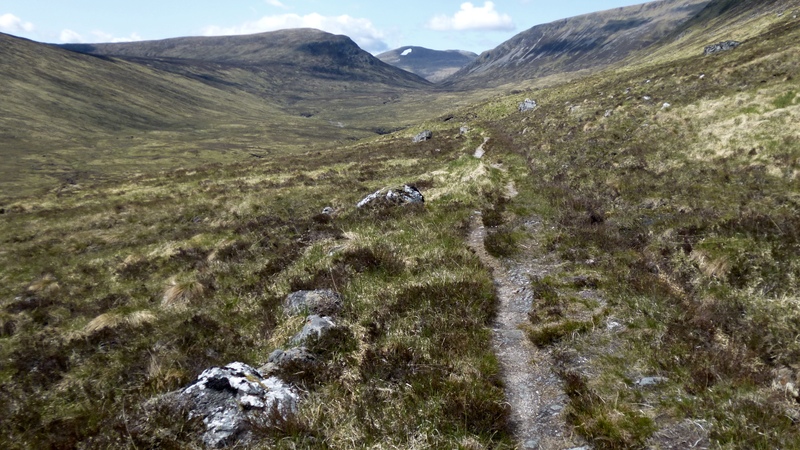 The trail that followed Ben Alder cottage was a beautiful narrow ribbon of rising singletrack. Out here in the full sun, I struggled to find my rhythm, still very much feeling I hadn’t shaken off my illness from earlier in the month. A top of sorts came, followed by a short descent and then another climb to the real top. A stunning view opened up in front of me, and the trail plunged down into the head of the next valley. Gian came past me again, riding with a fluidity that I longed to master, hopping each of the water bars like a gazelle. 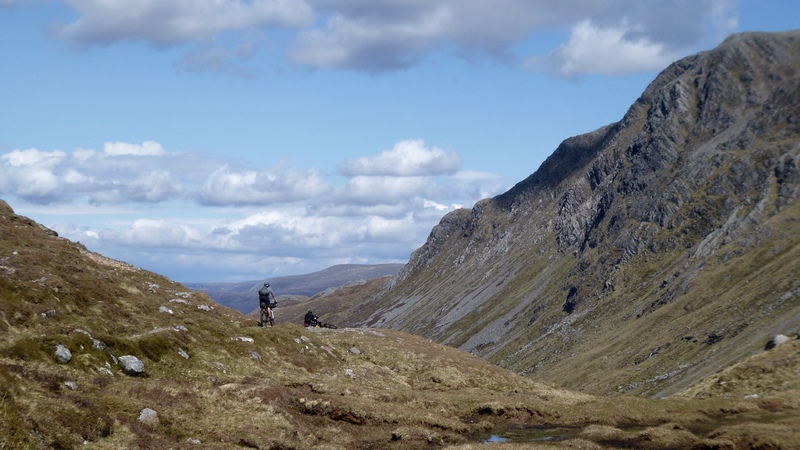 A small group of us formed after Culra Bothy, and I sensed I was losing ground rapidly. I tried not to let it bother me. Stick to the plan. Plenty of light left, still in good time for pizza. We rolled into Laggan Cafe at around 4:30pm, to find it had shut, but gentle persuasion by Rob Waller managed to extract 5 cans of coke and a range of cakes that were quickly devoured before we hit the road again to Corrieyarrick. It was here that I met up with RJ; we’d met the previous evening in the RFC, where he was dining with Gian. He’d come over from Vancouver, and had previous form on the Iditabike. We chatted as we cruised the lower road section, but as the climb started to steepen I found some strength for the first time that day and pulled away. Chris Purt was one of the Laggan Group, and he caught me just before the steep hairpins before the summit. Chris is an excellent rider, and he seemed to ease his way up these with minimum fuss. 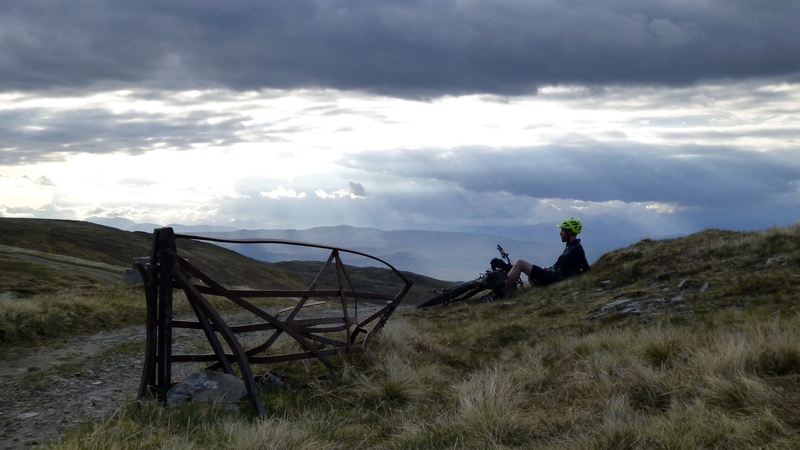 When I reached the top, Chris was kicking back in the early evening sunshine at the summit waiting for his partner, Ian Wilmshurst. From the top of the Corrieyarrick, the end of the day was starting to show. It had been a hard day. If you want an easy ride to Fort Augustus, don’t start in Tyndrum. But, it was less then 5 miles to pizza now and this spurred on Gian and I while RJ, Chris and rest of the Laggan group followed. As befits the end of 150km of riding, large amounts of Pizza and significant amounts of coffee and coke were consumed in an indigestion-inducing amount of time. We were all out of there well before 10pm, but somehow I managed to be one of the last to leave the place, and set off up the road in solitude towards my planned bivvy. 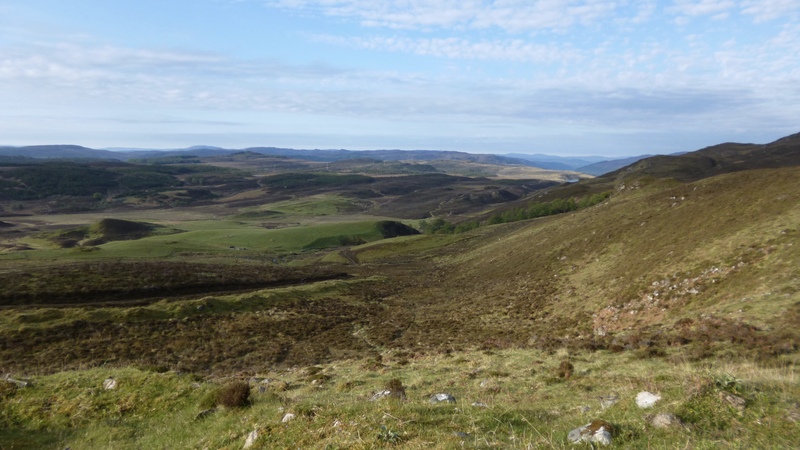 By Invermorriston, a group of four of us had reformed, of Gian, RJ, Andy Laurence and myself and we carried on up into the forest towards Loch ma Stac. 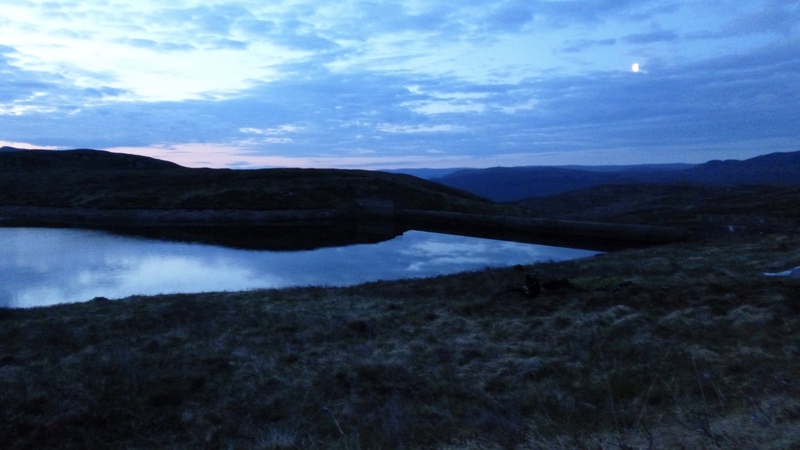 We pulled up at the first reservoir at about 11:30pm, which felt like a good end to the day. Nik Kinloch had already got his tent up, and we pitched in the general vicinity. The ride had gone to plan so far. I was exactly where I expected to be, and filled with pizza and a recovery drink, I was now feeling OK too. I heard a rustling at 2:50am, and looked over to see RJ packing up to go. Crikey, he’s keen, I thought. Too early for me though, but I only dosed until 3:30am before deciding to get up myself. As I got up, I noticed my sleeping mat was flat. Damn, punctured mat was not what I needed, but nothing I could do as I didn’t bring a repair kit. 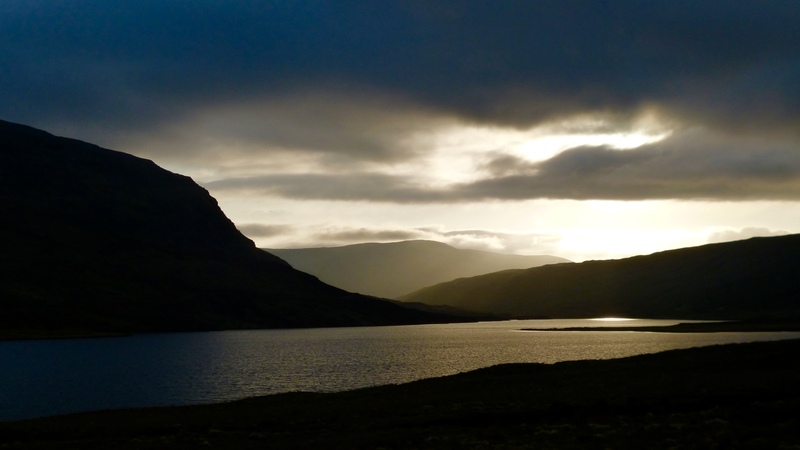 I left Andy, Gian and Nik still sleeping, and pedalled on up the track, arriving at Loch ma Stac just as it was getting light. 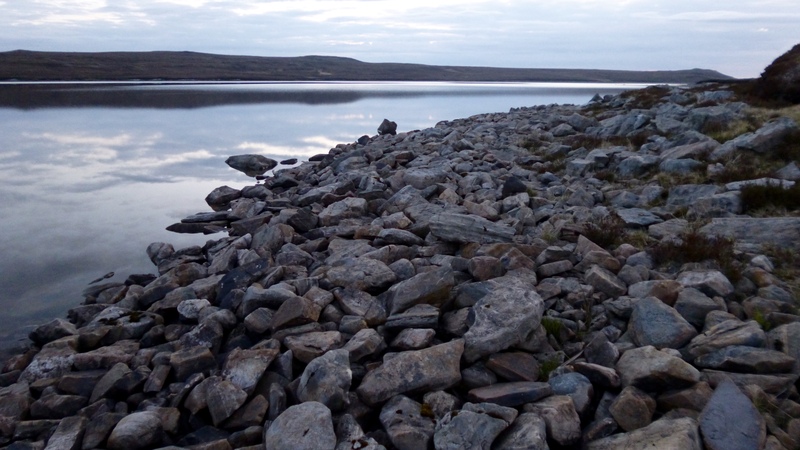 Having done this part of the route twice already, I wanted to see the loch shore in the daylight. Whilst there are some really unrideable parts, it was better in the daylight than I expected. 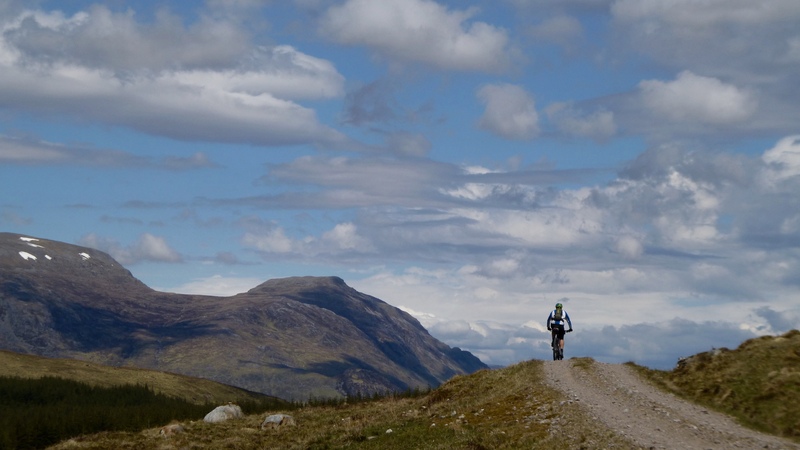 Once past Loch ma Stac, it was easy riding through Corimony and onward towards the Orrin. Sun finally broke the horizon, and I whizzed quietly past the bivvy of Steve Heading, Alan Sheldon and Bryan Singleton. I caught RJ up on the climb out of Erchless Forest, on route to the Orrin Track; he hadn’t had a wink of sleep, and contrary to me thinking he was trying to get the jump on us, he was just fed up of lying neither getting good rest nor making any progress down the trail. While we swapped notes, Kenny Decker (from Washington DC), came up too. Kenny has only been mountain biking for a year, but his Ironman pedigree was showing through and he had awesome strength and a refreshingly bright attitude to the whole thing. The three of us continued along the “track of a thousand puddles” on what was looking like it would be another good day. We pulled up at the Old Concrete Store and pulled out some chairs and sat in the sun for breakfast. Life was good. We arrived at Contin for a second (or maybe third) breakfast. I stocked up on coffee, coke, crisps, coronation chicken sandwich, strawberry milk and a couple of other things I can’t remember. They went down with ease. As we sat out in the sun eating, Steve, Alan and Bryan arrived not long after and joined us for food. Kenny was the first to depart, and I soon followed leaving RJ in search of shade for an hour’s nap, and the others still at the trough. 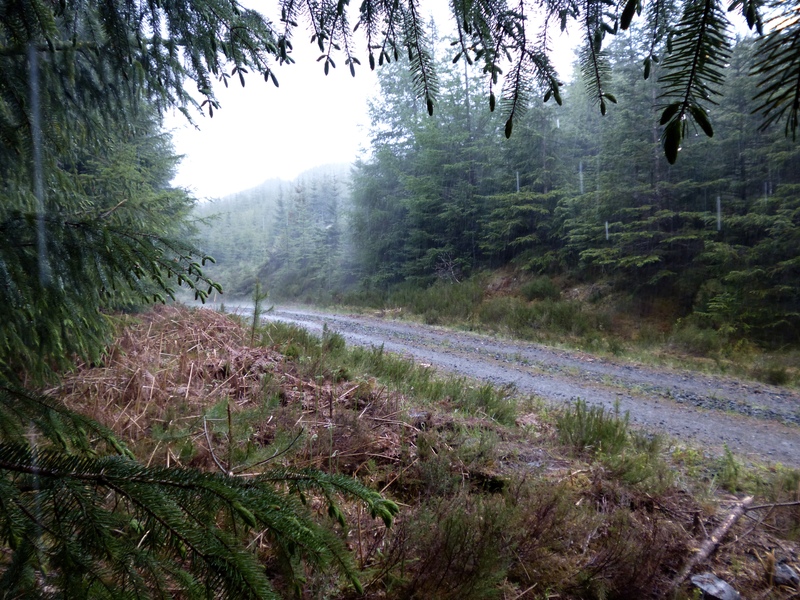 Through the forest past Garve, the sky darkened, and the first drops of rain fell. It didn’t seem to come to much for the best part of 20 minutes, and I was nearly at Inchbae Lodge when the heavens opened. I donned my waterproofs quickly, and retreated to the cover of some spruce trees while it hammered down. Thinking it would pass in a few minutes, I decided to wait for it to blow over. Then Steve & Co whizzed past. Steve, Alan and Bryan don’t half ride at a pace. Whilst I’d caught them earlier on, I was now starting to feel the impact of that effort, as Steve set the pace ripping up the track towards the Oykel Bridge Hotel. As the track deteriorated, I eased off and let them go. Still within sight, but the compulsion to stay in contact faded. Another clap of thunder sounded directly overhead and the sky issued more large heavy rain drops. I was just getting dry too. Not far to the hotel now though, but on the descent to OBH, I noticed that my chain was running slack if I back pedalled. Thinking it was a mis-shift, I changed gear and tried again. Hmm, definitely something not right there. I pedalled carefully to the hotel and decided to get some food while I thought about what the problem might be. The OBH had laid on a special menu for HT riders, and it wasn’t long before a large plate of Venison Bolognese arrived. Not long after that, the plate was empty. It was time to get oily. Close inspection of my drivechain revealed a stiff free hub bearing. Not good. Regular readers will note it’s not the first time rear hubs have caused me problems, and following the last incident, I’ve switched from a popular UK brand to a high quality American one. I cracked the axle end-caps off and pulled the cassette, free hub body and axle out of the hub. Hub bearings were fine, but the axle would only move 1/32nd of a turn in the freehub body. The hotel was able to provide some WD40 and I lathered the inside of the freehub with the penetrating oil. Unfortunately, there’s a neat plastic seal that is really really effective at keeping WD40 out of the inside of the hub shell. This had to be a salvageable situation. I wasn’t going to give up that easily. Then I had an idea; I managed to give the axle a whack from one end to dislodge it inside the hub shell. This allowed it to move forward against the inside of the cassette lock ring (which I would have removed much earlier, had I not left my Next Best Thing at home…). This was enough get some WD40 past the plastic seal and to my delight the axle suddenly span freely inside the freehub. I followed through with a liberal dose of chain lube and quickly bolted it all back together, tying not to think of the state of things internally. This whole episode had taken over 45 mins and probably taken a year off my life with worry and anxiety, but I was rolling and that was A Good Thing. Invercassley next, and it was only 6pm. The sun was low and warm and it wasn’t long before I passed my planned bivvy for the night. Way too early to stop now though, so I decided to carry on to see how far I could get by dark. 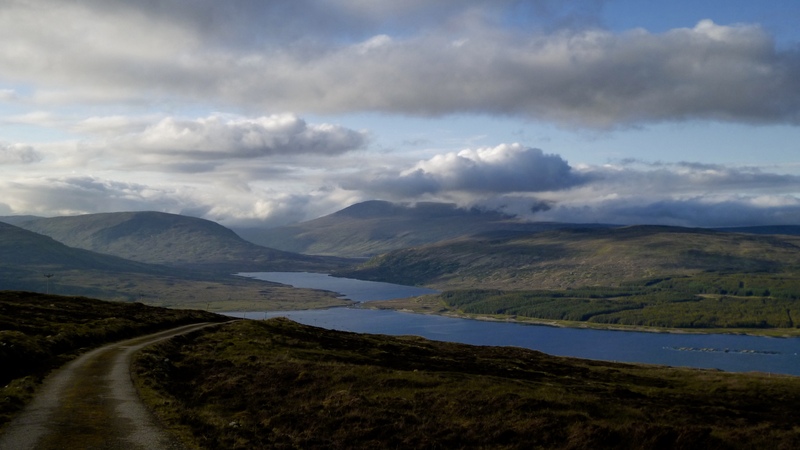 The steep climb over Maovally finally relented and far reaching views over Loch Shin were revealed. 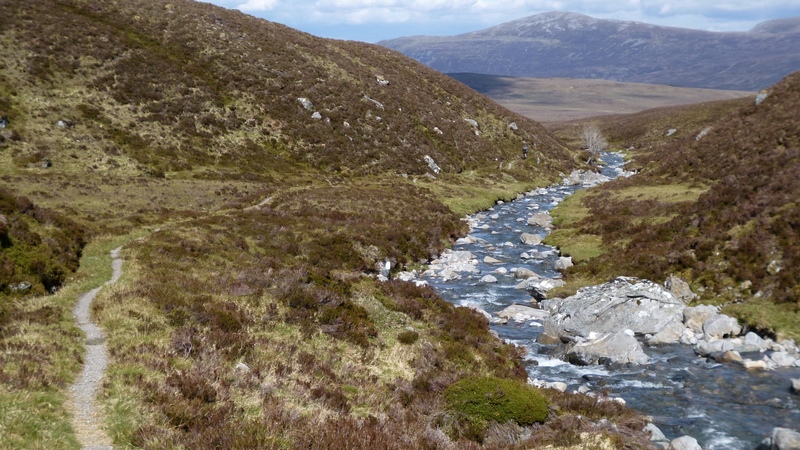 A fast descent in rapidly cooling air brought me to the bottom of the glen. I could see the thick cloud hanging over the Bealach Horn. Did I fancy going over that in the dark? 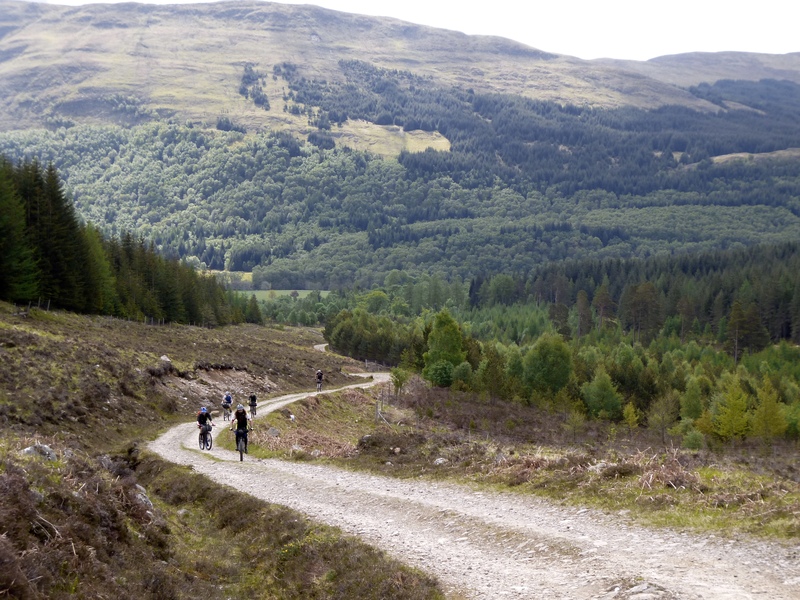 The sinuous singletrack around the lochans, the peat hags, the climb out from An Dubh Loch? It didn’t fill me with excitement, but it was too early to tell; I need to get into Glen Golly first. 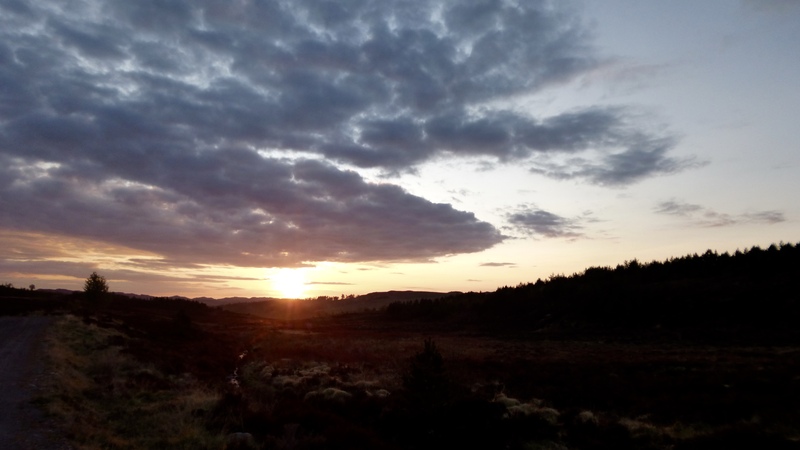 By the time I got to the bottom of the track that leads to Gobernuisgach Lodge, it was getting on for dark. I carried on, as soft ground here was sparse and with a punctured sleeping mat, I needed a soft patch to get a good sleep. The turn for Glen Golly came before the lodge, and I followed the trail up; climbing steadily to begin with then diving down some steep loose hairpins onto a hanging meadow. The midges were out so there’d be no bivvy here. I continued on a bit higher until I caught a breeze that kept the winged teeth at bay. I lay myself down at the first man-sized patch of flat rock-free heathery ground I could find. It was 11:00 pm. I was done. Bealach Horn could wait until morning. Sleep came easily.